SPACE! 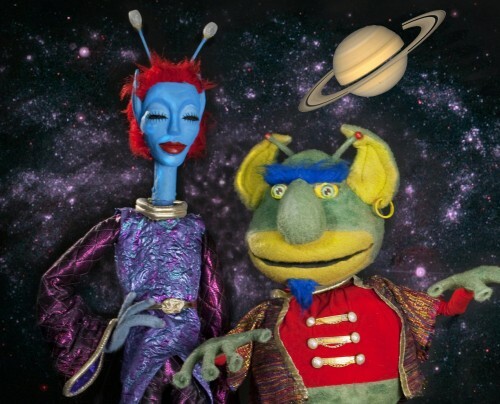 is a rock concert, a science class and an out-of-this-world fantastical puppet show! The Center for Puppetry Arts has a fantastic array of kids programming, much of it perfectly enjoyable for grown-ups alike! THIS show is part of the Center's 2015-2016 Family Series...and, there's a lot more! Ot and Eema, the awesome alien creatures pictured above, serve as hosts on a journey through our solar system...and beyond. Their space travel, including a visit to a flowing green meadow on Earth, is hilarious, musical, entertaining and educational...but don't let that last descriptive get in your way of great fun. Personally, I love it when education and fun meet for a great time! The mere handful of puppeteers in this show perform the characters that range from our stars Ot and Eema to Issac Newton to three rock stars who regale the greatest majority of our tale in music...rock music! And they do it via puppetry (including hand and rod, and shadow puppets, etc. ), animation and projection...and more. Considering some of our solar system's planets are mostly rock, a rock concert celebrating them is quite a clever rendition. But the gas giants are hardly ignored...except for the beautiful blue one, beyond a mention. Poor thing. I have to admit that I was rather concerned when I saw a diagram of nine planets on stage depicting our solar system. Understanding fully the scientific classification of Pluto as a dwarf planet, I was delighted to see Pluto's actual role in our solar system so simply explained, and was surprised to learn of other dwarf planets in our solar system--even as enthusiastic as I am about space, I learned something new! Awesomeness! So, maybe you wonder why I'm writing about a children's puppet show? The published recommended age range is "4 and up". Obviously I fall on the "up" side of that range, but the kid in me found it as delightful as any youngster. Allow me, please, to share a call to action...one that is personally important to me. Please, please, please...if your child has an interest in space, encourage him or her! Stay with me while I share a few reasons of what their rewards may be. I've been a science and space enthusiast all my life. As a kid, my Saturday morning cartoons always included Star Trek: The Animated Series. My favorite class in college was Astronomy (the trigonometry and physics were a surprise--I thought we were just going to look at awesome celestial phenomenon--but it was a wonderful learning experience). And my professional life landed me in aerospace for nearly nine years. I've stood under the belly of the Space Shuttle Endeavour! That was one of those experiences that will forever be embedded on my memory as a uniquely remarkable experience. I also saw Atlantis on her launch pad just days before liftoff. I've toured the White Room where components of the International Space Station were being readied for delivery to space approximately 200 miles above the surface of Earth. And I've met Shuttle Pilot Kevin Chilton (Space Shuttle pilot, now General in the Air Force) and many other astronauts, each encouraging and a role model. I've also visited the Baikonur Cosmodrome, where the first human in outer space launched from and where I saw this satellite launch...live! One of my greatest outer space memories....meeting Leonard Nimoy--Spock from Star Trek--was a dream come true! This is all to say that if your child expresses an interest in outer space, science, any of the space sciences and/or aerospace, please encourage their curiosity! You never know where it might take them. I wasn't encouraged, but I wasn't discouraged. I've seen things, met people and been places I only imagined when I was a kid. Imagine your kid becoming an astronaut! And, like I said, this is an awesome, entertaining puppet show, too! SPACE! is showing at the Center for Puppetry Arts through Thursday, March 10, 2016. And remember to check out the other awesome shows in the Center's 2015-2016 Family Series. "Thank you!" to BravePR Atlanta for the tickets! As always, opinions expressed in my posts are always my own and not influenced by other entities, ever.